LifeInBasel.com, is dedicated to providing quality information for people moving to Basel, Switzerland or for those that have already moved to Basel. The site was recently featured in the 20mins newspaper and on RadioX: The English Show. About 30% of the population of Basel are expats, many of them English-speaking. Those that have just moved are homesick, culture-shocked and looking for new retailers to provide them with the goods and services they need. The audience of the site is growing on a daily basis, and we hope it will increase steadily as the site matures and the amount of content increases. They visit the site for about 2 minutes and look at multiple pages. As of the end of July, 2016 over 141,000 different people had visited the site. We regularly receive between 300-500 page views per day, with about 75-80% of these visitors being new to the site!! About 50% of site visitors are already in Basel. Another 40% are people from the USA, UK and other English speaking countries that are considering/planning to come to Basel. Advertising on Life in Basel will give your business exposure to this broad audience, and increase the likelihood that they will go to your store, restaurant or website. Volume discounts are possible, if you’d like to place multiple ads. Alternatively, payment may be accepted in goods or services; this will be decided on a case-by-case basis. 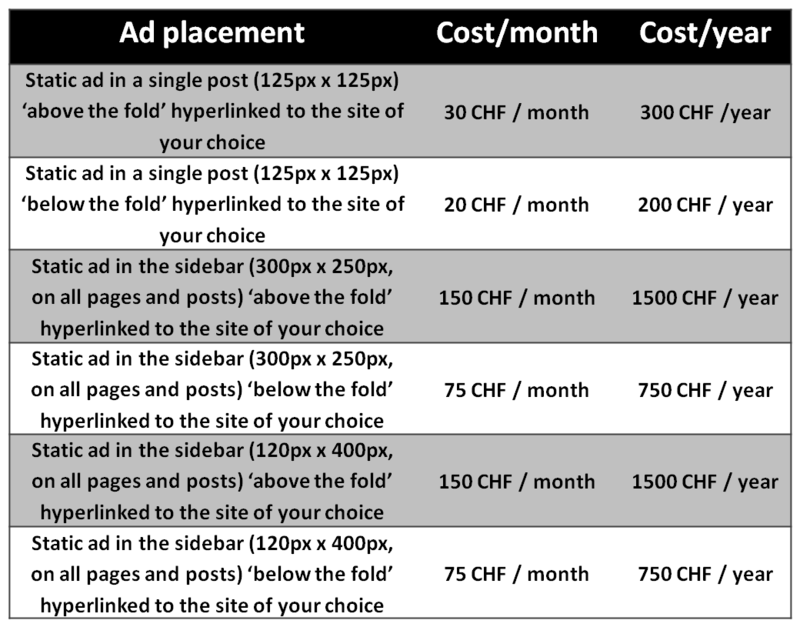 Life in Basel reserves the right to change pricing, and to reject any ads it deems inappropriate for the site. All ads must be sent to Life in Basel for approval prior to finalization of the advertising contract.